A delicious ripe juicy strawberry is sure to put a smile on your face. Lazy summer days at the pool, exotic desserts after a meal, strawberry milkshakes, all these create great happy feelings. Capture these feelings and keep them close by with this glorious little key ring. It is crafted in the design of a luscious strawberry with a small leaf at the top. 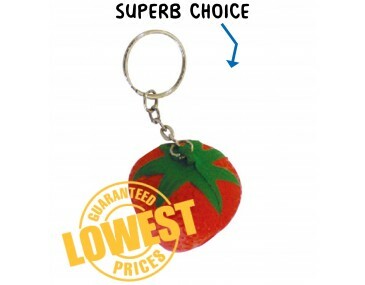 The fruit attaches to a metal chain and key ring, making it easy to attach your home, car or office keys. The strawberry is even more fun, because it it is also a stress buster, Squeeze it, bash it or smash it and it will return to its original cute shape. Uplift your marketing campaign and use these trendy items as promotional gimmicks. We will brand them with your personalised company logo or graphic in a single colour print, this process is included in the listed price. Please note that our prices exclude GST and a print set up of $75 applies. We offer a product turnaround time of two weeks, but we can offer even faster turnaround times for urgent orders. This product is supplied in bulk quantities. This product stocked and branded in Australia.